This is the new artwork for one of 10 alternative Christmas cards of archdiocesan Nutritional Development Services, which distributes free food to needy people in the Philadelphia area. 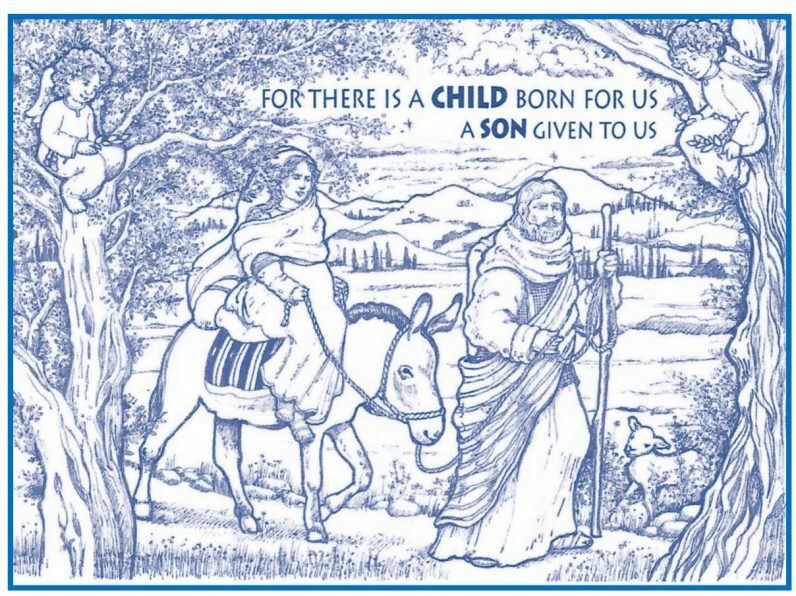 It wouldn’t really be Christmas at Nutritional Development Services of the Archdiocese of Philadelphia without the Alternative Christmas (not Holiday) cards they offer annually. The cards represent not only an appropriate way to send greetings for the joyfully holy season, each card represents a donation to NDS’ food programs that provide so much help to the needy in our area. It depicts Mary and Joseph on the road to Bethlehem. Mary rides the traditional donkey and Joseph is on foot, as two cherubs watch over the blessed travelers from overhanging trees. Actually, there are about 10 different cards still available from previous designs executed by Smith. “Patty has done all of this for us and has offered this to us free of charge” said Denise Hopkins, the administrator of the Community Food Program, which distributes free food to many cupboards throughout the region. Cost of the cards are a pack of 10 for $15 or a pack of 20 for $25, or multiples thereof. Cards can be ordered through Nutritional Development Services at 222 N. 17th Street, Philadelphia, PA, 19103 or by calling NDS at 215-895-3470. For more information about the new card and the NDS Community Food Program, visit the website CommunityFoodProgram.org. Remember, this is not just a Christmas greeting to a friend, it is a gift to the poor.